Stepping into any new environment for the first time can be a little intimidating. This is just as true of a church as it is of anywhere else. For this reason we want to give you an idea of what to expect when you come. We hope you will find New Carlisle Wesleyan Church to be a family. We laugh often, talk a lot, make mistakes, share life, and grow together. We have many diverse interests and personalities, but what we have in common is Jesus Christ. ​Here are just a few of the most often asked question about attending church. We hope these will help you know what to expect on your visit. If you have a question that has not been answered, please feel free to contact us via email (ncwconline@csinet.net) or call 574-654-7898. Each week you will experience modern music and a message from the Bible that is relevant and engaging from one of our pastors. These services are designed to be an hour in length. New Carlisle Wesleyan has a "come as you are" atmosphere. You will see some dressed up; some dressed casual. We have no expectations for attire. Our children's ministry is uniquely designed with your child in mind! Every Sunday, all children (babies through 5th grade) experience safe, age-appropriate environments where the Bible is taught in a creative and relevant way. We are passionate about kids learning about Jesus in a way they can understand. We hope that you choose to come and experience one our services for yourself. A fresh cup of coffee is waiting for you! New Carlisle Wesleyan Church is located on Early Road just a half mile east of Timothy in New Carlisle Indiana. 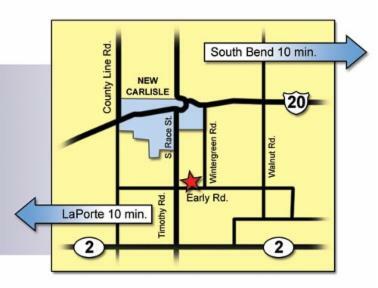 We are located just minutes from the South Bend Airport, La Porte and Michigan City.